So, you think you might want to be a 4-H robotics volunteer but aren’t sure if you have the skills or education to do it? Relax — if you have a passion for helping youth realize their potential, know how to have fun, and recognize the importance of snacks — this volunteer job is for you! The Steps to Become a 4-H Volunteer from MSUES CTO - Distance Education on Vimeo. If you are wondering what a typical robotics volunteer does, read our Gear Up to Volunteer publication which goes through a normal robotics calendar year. Still interested in volunteering? Contact your local county Extension Agent! After you and your Extension Agent meet, you will need to complete the 4-H Volunteer Packet and Background Check. Other volunteer references include the 4-H Volunteer Quick Reference Guide. 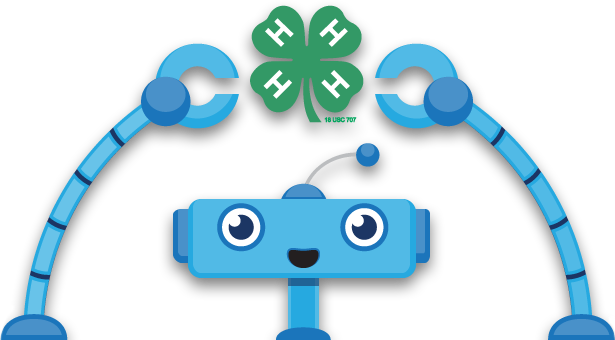 Next, work with your Agent to complete the 4-H Robotics Year Round Training Guide and develop your robotics calendar. Use the materials located under Curriculum to organize your monthly meetings. Youth, clubs, and advisory councils are also encouraged to complete record books.